Hello. 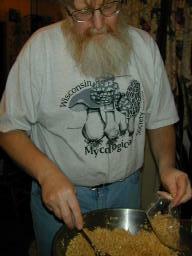 My name is Peter Vachuska and I live in West Bend, Wisconsin. 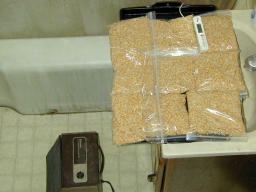 Back in the 1990's I noted a shortage of instructional web sites on how to make tempeh, I decided to put up this page showing how I make tempeh. There are now (2014) quite a few places showing one various ways of making tempeh, but it's my hope that this page will still be of some help. First of all, you need the raw ingredients. 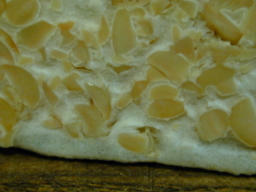 The most difficult to obtain is the tempeh starter (the spore mixture that contains the seeds of the fungal culture, Rhizopus oligosporus). This starter has been getting harder to find. I have found good starter on ebay, from "patafixer" out of the Czech Republic. Delivery to the states was fast, within a week or so, and I was happy with the starter. 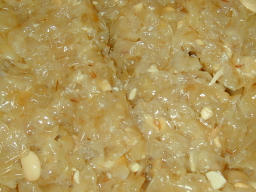 One can also buy starter from Tempeh Starter Shop. They ship from Australia. I have not had experience buying starter from them however. If anyone has any good sources please let me know. The other main ingredient is, of course, soybeans. These are fairly easy to come by. Go to a natural foods store or a mega-grocery store. 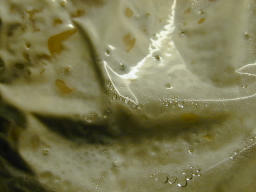 Other ingredients are a few tablespoons of vinegar and lots of water. 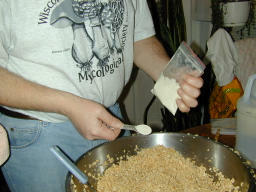 Here are some photos of how I make tempeh. 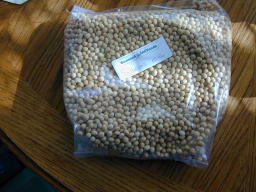 Here I started with 2.5 pounds of dry soybeans and used 4 tablespoons of vinegar and 2 teaspoons of starter. 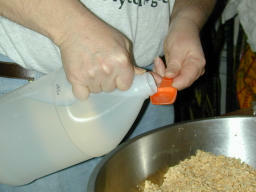 However, the success or failure of a batch isn't very sensitive to the amounts used. First boil the soybeans for an hour or so. Soybeans are very tolerant to being overcooked. Next you should remove the outer skin from the beans and split them. 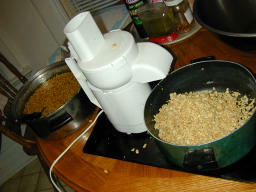 To do this, I use the slicing (not grating or chopping) attachment on my little food processor. 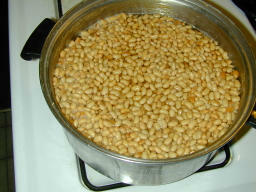 I drain and rinse the cooked beans and run them all through the processor. (This can be messy.) This chops up the beans a little more than they would be if they were dehulled by hand, but it is very fast and easy and doesn't significantly affect the finished product. Next the hulls should be separated. (Some people prefer to leave them in.) 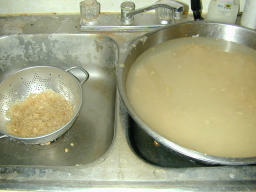 Fill the bowl containing the bean with water and pour off the water with some hulls through a sieve catching the hulls. Do this about five more times and you will have removed most of them. Now drain the beans thoroughly. This is the most important and critical step. Put the beans on a couple of towels and rub them dry. I don't think that you have to go overboard here, but having the beans too wet is probably the most common reason for spoilage and failed batches. Now put the beans back in a mixing bowl, add vinegar and starter, mix thoroughly, and you're ready to bag. I haven't experimented with a lot of containers. 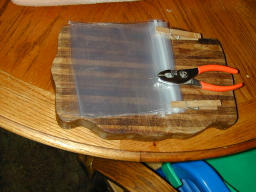 Reclosable sandwich bags work really well. You must punch them full of holes before using. I clothes-pin about 8-9 together and with a nail, and pliers to hold it, put holes about 1/2 in or 1 cm apart in them all. (It's hard to get too many holes.) An ice pick would be ideal for this. 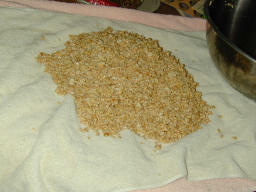 Now fill each bag about half full, so that the beans, loosely flattened are a couple of centimeters thick. Place on a rack or a towel and put in an incubator at between 86-90 degrees Fahrenheit. I use our second bathroom with a space heater and a thermometer. It's pretty easy to adjust the temperature with the space heater in this range. [Note: Be sure to remove all flammables.] Check every half hour or so at first, until you get the temperature steady. I like to keep the temperature at about 88 degrees. 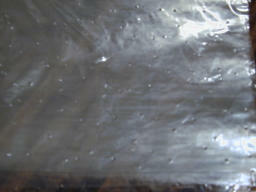 After about 15-16 hours you suddenly start to see condensation on the inside of the bags. 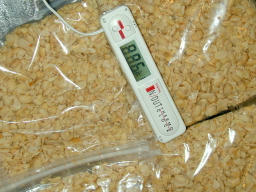 The bags also start to generate their own heat at this time, so you should turn down the heater to compensate. 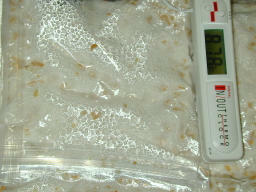 At 21-22 hours, you start to see the white mycelium. At 24-26 hours you can see little grey spores develop around the holes in the bags. At this time they are done. You can use them fresh, refrigerate, or freeze. Remember that they are still generating heat, so don't put them all together when you freeze or refrigerate. You have to shut-down the growth. 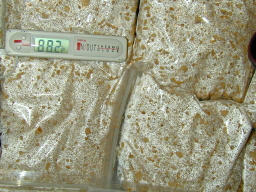 They can be stored in the bag they grew in in the refrigerator for 3-5 days - at most a week.